Countering the idea that China's smartphone market is only interested in cheap phones, Umeng, the nation's largest analytics firm, has issued a report for 2013 outlining that 27 percent of China's smartphones cost over $500, and that 80 percent of those are iPhones. Highlighted by analyst Benedict Evans, Umeng's report (embedded below) details that China's market for smartphones and tablets exploded in 2013, nearly doubling from 380 million devices at the beginning of the year to more than 700 million by year end. Apple currently markets three iPhone models on its Chinese website: iPhone 5s priced between $860 and $1120; iPhone 5c priced between $730 and $860; iPhone 4S priced at $535. The company originally continued to sell iPhone 4 in China priced at $435, but no longer lists that model for sale on its public website. The fact that Apple has dominated China's most valuable segment of the smartphone market is particularly noteworthy because throughout 2013, it didn't have any agreement in place to sell iPhones on China Mobile, the nation's (and the world's) largest mobile carrier by far. Apple inked a deal with China Mobile in January, making iPhone 5s and iPhone 5c two of the very few models capable of working on the carrier's newly deployed 4G network using a China-specific version of LTE technology. Apple's chief executive Tim Cook told shareholders last month that both the iPhone 5s and iPhone 5c had outsold the models they replaced. Evans separately noted that Apple now has "probably more" iPhone users in China than it has in the U.S., with around 100 million iPhone users in each country. Last September, Cook noted Umeng research stating that the total number of Chinese iOS developers has increased 9.3 times between 2011 to 2013. Globally, Apple has over 6 million registered developers, with 1.5 million added in just the last year Cook said. Evans rhetorically asked, "Has any foreign tech company done as well in China as Apple?" Has any foreign tech company done as well in China as Apple? Samsung, in contrast, has only captured 24 percent of China's Android market. In the U.S., Samsung maintains 26 percent of the entire smartphone market, behind Apple's 45 percent share, meaning Samsung's models make up nearly half of the U.S. Android market. Umeng detailed a series of trends related to apps, including a breakdown of what types of apps are used by different price tiers of smartphones. "Users of phones priced below $150 tend to spend more time playing games and their favorite app categories is theme and wallpaper," the firm noted. "They are often sensitive to the price, have low requirements for the performance of phones, tend to be affected by pre-installed apps, and are less likely to use e-commerce, finance, health and lifestyle apps." In contrast, Umeng stated that "users of high-end deices have more diverse needs and favor apps for news, navigation, finance, and ecomerce.. They might thane certain economic power, but more importantly, they rely on mobile Internet and their life patters will be shown on mobile devices, such as their demands for getting information, learning, shopping and finance management." 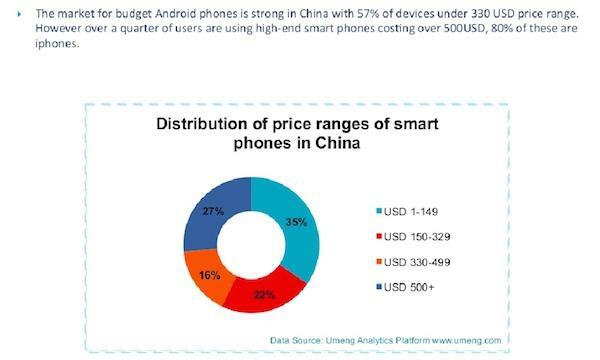 Umeng's data outlines that devices selling for less than $149 make up just 35 percent of China's smartphone market. Phones priced between $150 and $329 account for another 22 percentage points, while devices at $330 to $499 make up 16 percent of sales, leaving 27 percent priced above $500. "The market for budget Android phones is strong in China, with 57 percent of devices under the $330 price range," Umeng stated. "However, over a quarter are using high end smartphones costing over $500; 80 percent of these are iPhones." The firm also notes that the market for users new to smartphones is shrinking, and that a much larger percentage of smartphones are now upgrades for existing users, a trend that would appear to benefit higher end devices rather than cheap, entry level offerings. Umeng's data highlights the fallacy of overall market share figures that throw valuable market segments together with low value volume sales. Data publicly published by IDC, for example, stated that Apple had "only" 7 percent of China's entire smartphone market, a figure that misled a variety of journalists into thinking that Apple's percentage points of market share were equal in value to the percentage points taken up by vendors of cheap devices that do not make any money. 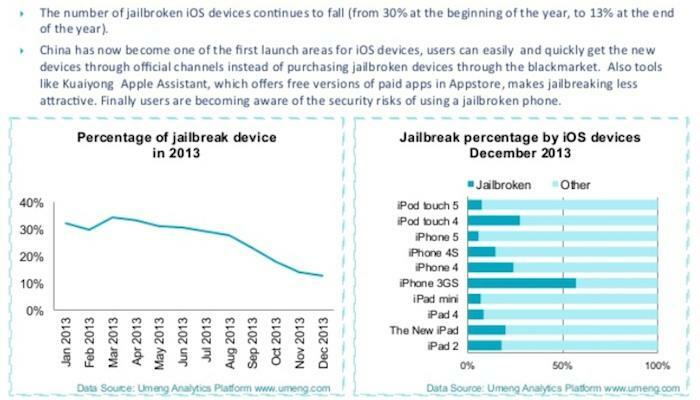 Another trend Umeng highlighted is the rapid decrease in users jailbreaking their iPhones. While more than half of all iPhone 3GS models were jailbroken (in large part to enable them to work on local networks prior to their to receiving official support from carriers), only a tiny fraction of recent models are. Overall, "the number of jailbroken iOS devices continues to fall (from 30% at the beginning of the year, to 13% at the end of the year," Umeng reported. "China has now become one the first launch areas for iOs devices. Users can easily and quickly get the new devices through official channels instead of purchasing jailbroken devices through the black market." The analytics firm noted that users are also "becoming aware of the security risks of using a jailbroken phone."